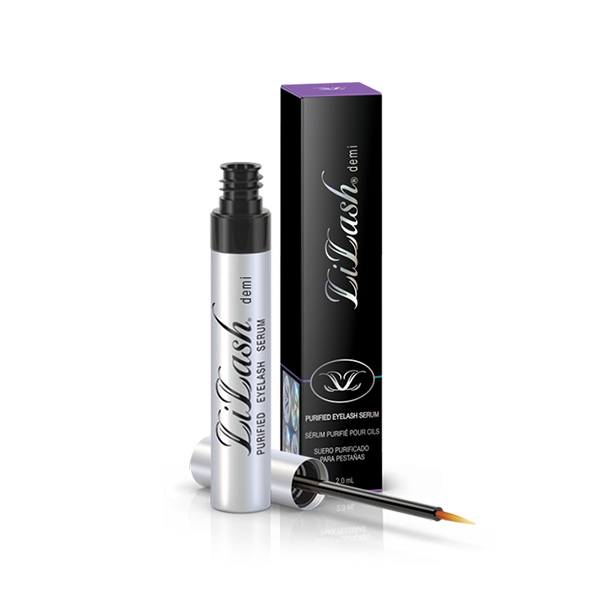 Lilash eyelash enhancing serum comes in two capacities: 2 ml and 4 ml. According to the manufacturer, the smaller one lasts three months whereas the bigger one – six months. It is advisable to get a larger version because you’ll be in the middle of the treatment after 3 months. Lilash serum has a very high price when we consider the amount of the product. The silver bottle has an artistic black writing. Lilash is packed in a violet and turkois box. You need to get used to using an eyeliner-like brush which is quite dense in this product. If you’re not skilled enough, the serum may get into your eyes. We wouldn’t like to waste the product that costs so much money. If you use the serum regularly, you will notice the effect of longer and thicker lashes after about 7-9 weeks. Lilash serum is absorbed pretty quickly. It penetrates inside hair follicles where it regenerates hair bulbs and makes lashes stronger. Lilash eyelash serum comes with a brush resembling an eyeliner, which allows for applying the product to eyelids, precisely to the lash line. One layer of the serum is enough. You must apply it once a day, preferably in the evening. You need to get skilful to use the large brush. Otherwise, Lilash serum may drip into the eyes.